Tombstone Dan loved his life in the Old West. He loved building a wonderful home in a hidden canyon. Over a hundred years later, known as one of the best forensic historians in the business, Margaret “Maggie” Lund finds herself faced with the impossible task of discovering if Tombstone Dan really existed. Two lives a hundred years apart twisting through history together. 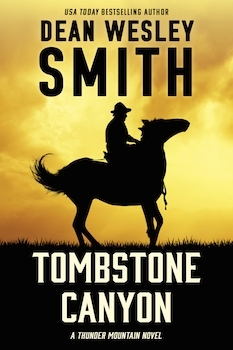 Written with attention to the real details of the Old West, Tombstone Canyon adds another riveting tale into the Thunder Mountain series of adventures.